PVC film shrinks to fit. 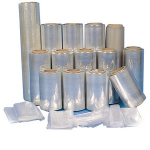 Speed your packaging operations by using PVC shrink bags. A common use is for DVDs and CDs. Polyvinyl chloride (PVC) shrink film is a type of shrink film that is used for many different applications except for direct contact with consumable products. PVC has excellent shrinking and sealing properties. When using pvc shrink film, the user must practice proper ventilation due to the strong odor it gives when heated. This pvc shrink film comes center folded, which means it doubles in width when it becomes unfolded. 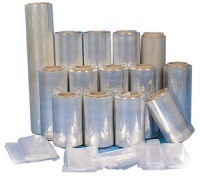 PVC shrink film can be used manually with a heat gun or with an I-Bar or L-Bar sealer. Polyolefin (POF) has great shrinking properties, it is smoother in texture and clarity, does not contain chloride, and is economical. POF is considered a thermoplastic material that shrinks when heated. This type of shrink film remains odorless when heated and cooled. Center fold pof shrink film is a great option for packaging a variety of products including consumable products. A heat gun is required for this product.